The Steinway neighborhood is named for Steinway and Sons, the piano business established by Henry Engelhard Steinweg in 1853 before emigrating from Seesen, Germany, to America. He opened a piano factory in Manhattan in 1860, and the family name changed to Steinway in 1866. Henry died in 1871, and his sons Theodore and Henry, Jr., continued to craft pianos while Henry’s brother William managed the business. Between 1870 and 1873, William purchased a 400-acre tract of land near Bowery Bay in Queens and built a factory and worker facilities. Steinway’s Astoria Homestead Company included a kindergarten, a church, a public trolley line, a bath house, parks, athletic fields, a free library, and frame houses for the workers. The factory eventually relocated, but the neighborhood still bears the name. 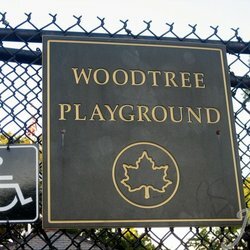 When the playground opened in October 1951, it featured handball and basketball courts, a see saw, a jungle gym, a gated wading pool, slides, swings, a comfort station, drinking fountain, benches, and a flagpole. A reconstruction was completed in 1996 with $849,000 in capital funding provided by Council Member Peter Vallone. Today the playground also holds dolphin animal art, play equipment with safety surfacing, a sprinkler area, and a flagpole with a yardarm.